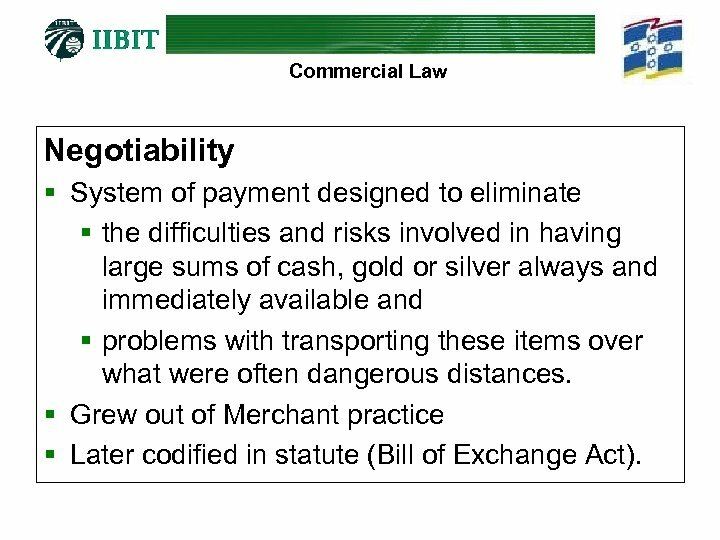 Commercial Law Negotiability § System of payment designed to eliminate § the difficulties and risks involved in having large sums of cash, gold or silver always and immediately available and § problems with transporting these items over what were often dangerous distances. 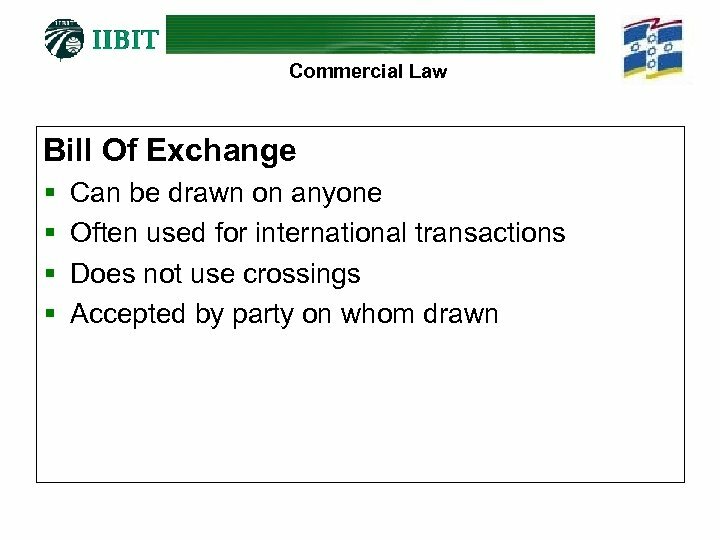 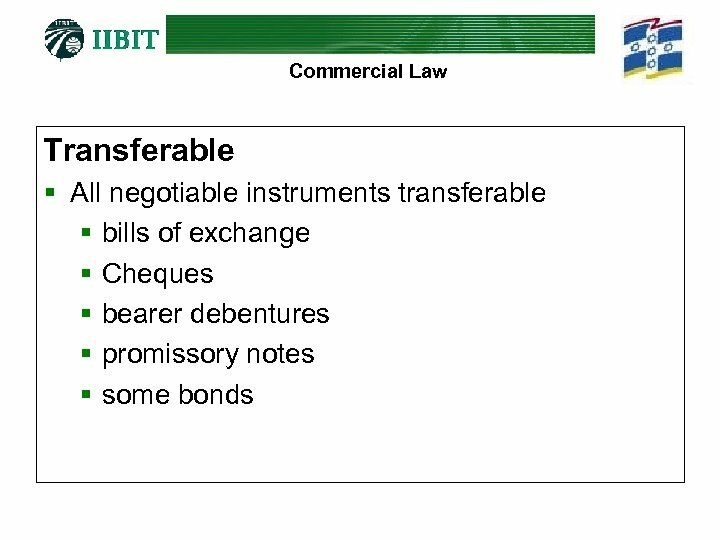 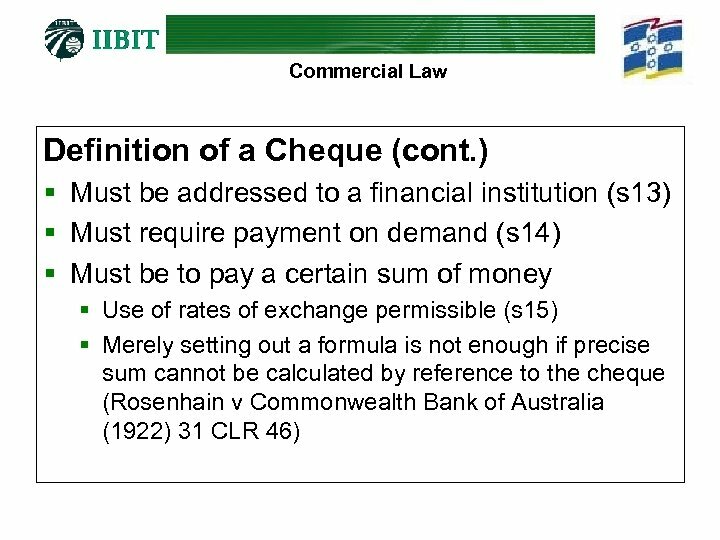 § Grew out of Merchant practice § Later codified in statute (Bill of Exchange Act). 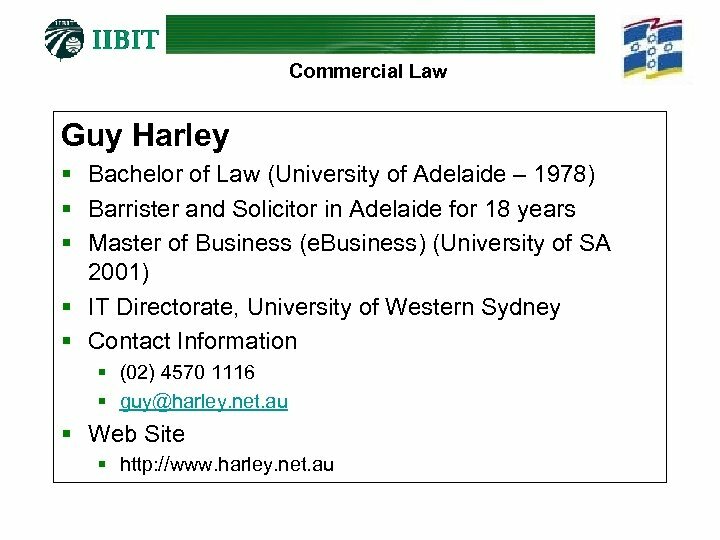 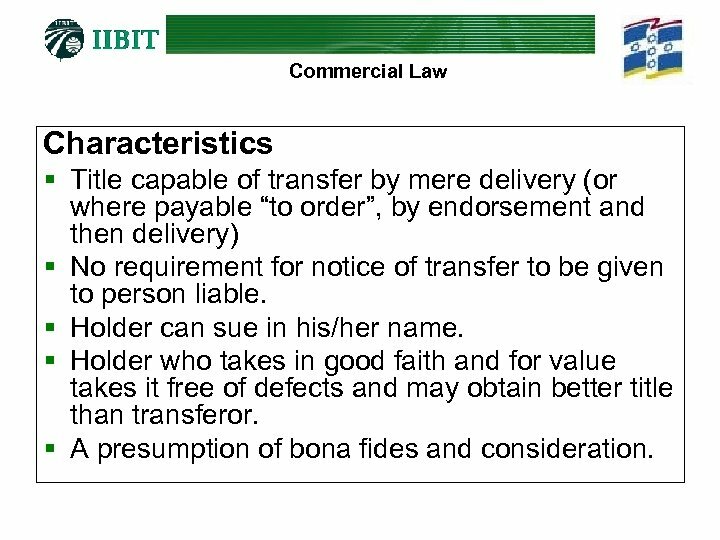 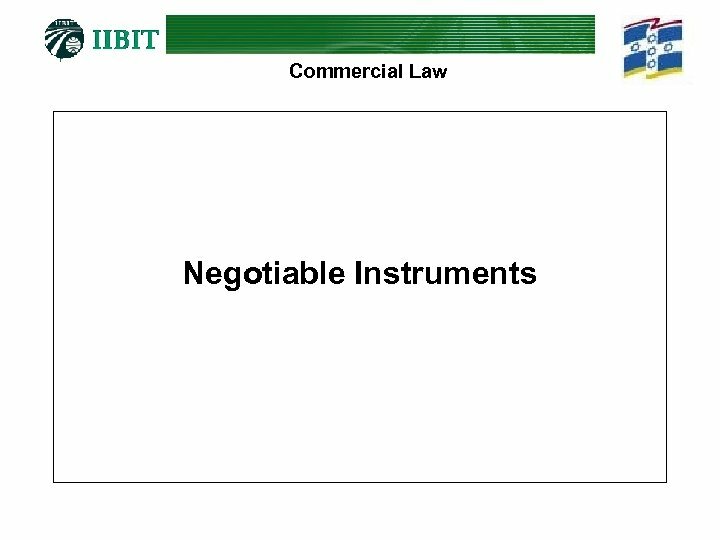 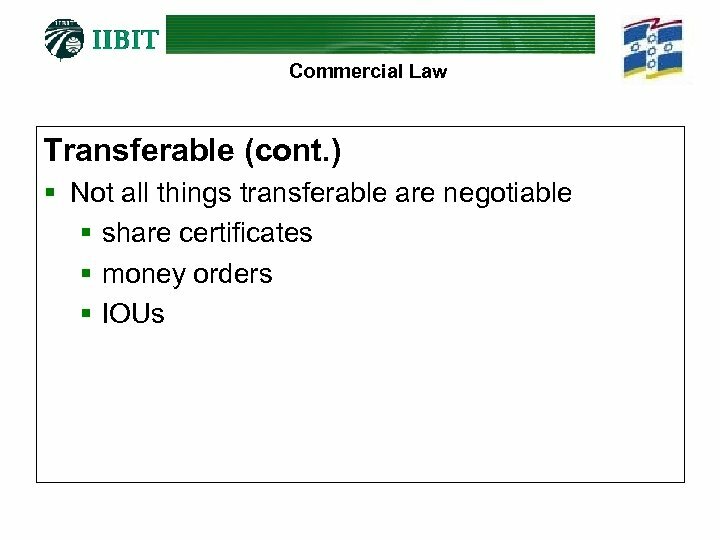 Commercial Law Characteristics § Title capable of transfer by mere delivery (or where payable “to order”, by endorsement and then delivery) § No requirement for notice of transfer to be given to person liable. 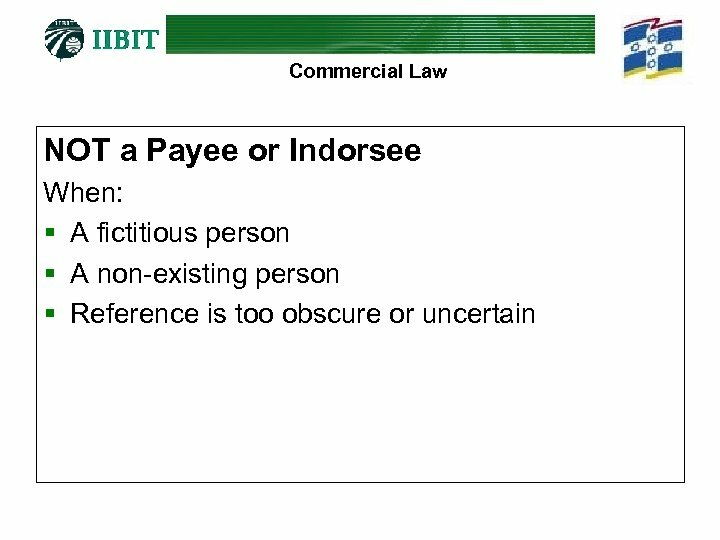 § Holder can sue in his/her name. 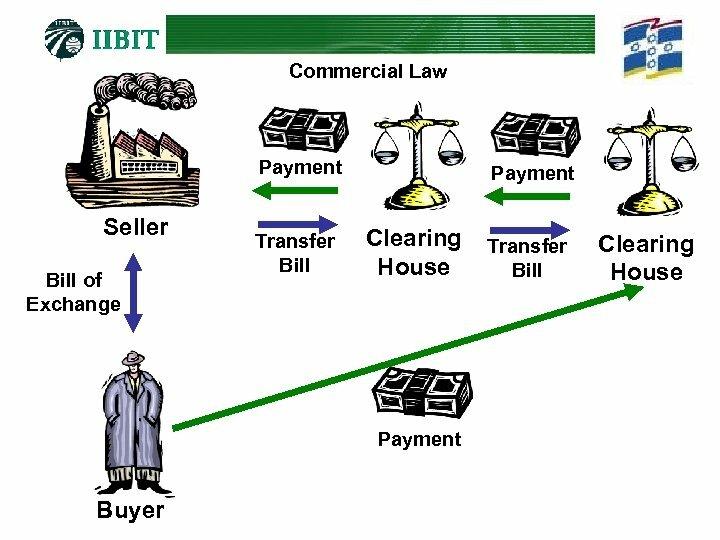 § Holder who takes in good faith and for value takes it free of defects and may obtain better title than transferor. 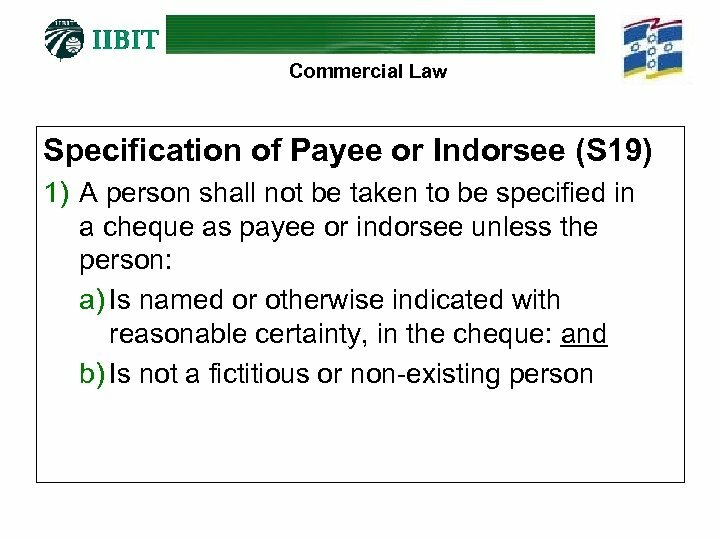 § A presumption of bona fides and consideration. 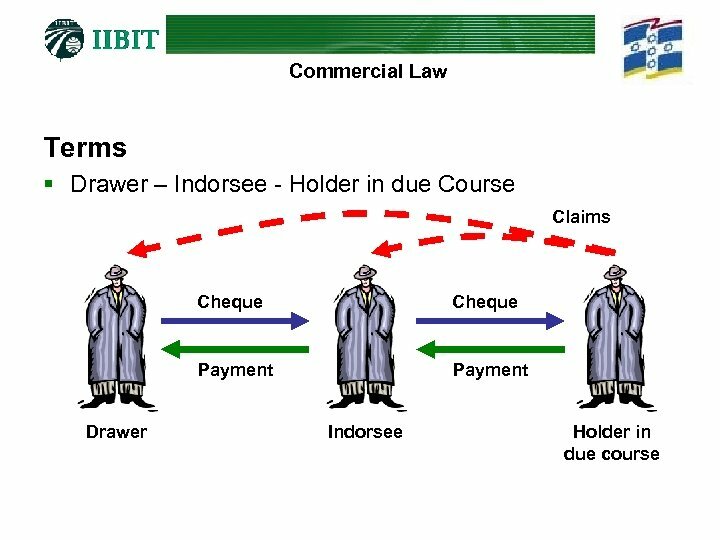 Commercial Law Commercial Bill Acceptance Facility § KD Morris & Sons Ltd (In Liq) v. Bank of Queensland Ltd (1980) 146 CLR 165 § In 1973 Keith Morris Construction Ltd group was Queensland’s largest building contractor. 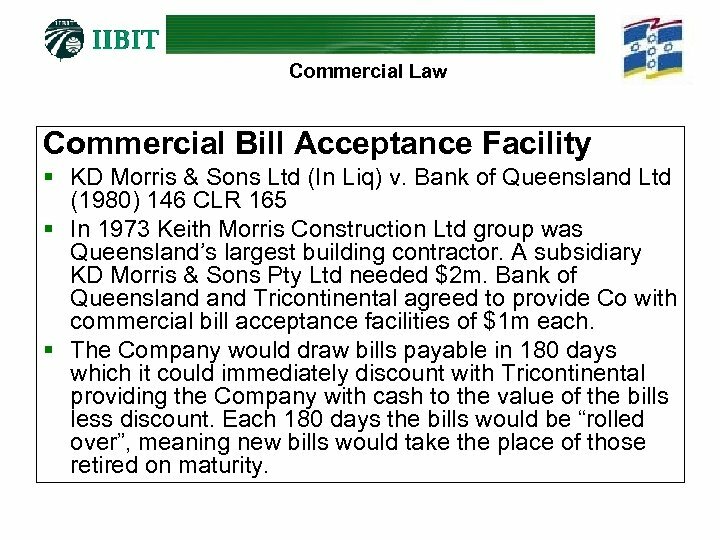 A subsidiary KD Morris & Sons Pty Ltd needed $2 m. Bank of Queensland Tricontinental agreed to provide Co with commercial bill acceptance facilities of $1 m each. 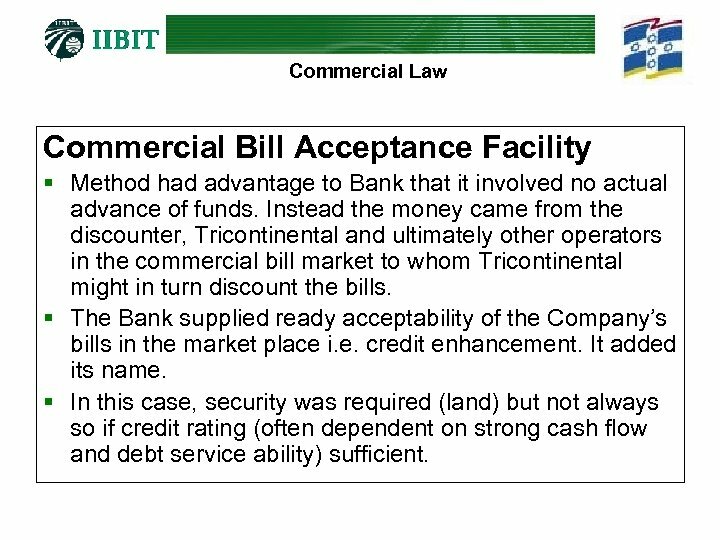 § The Company would draw bills payable in 180 days which it could immediately discount with Tricontinental providing the Company with cash to the value of the bills less discount. 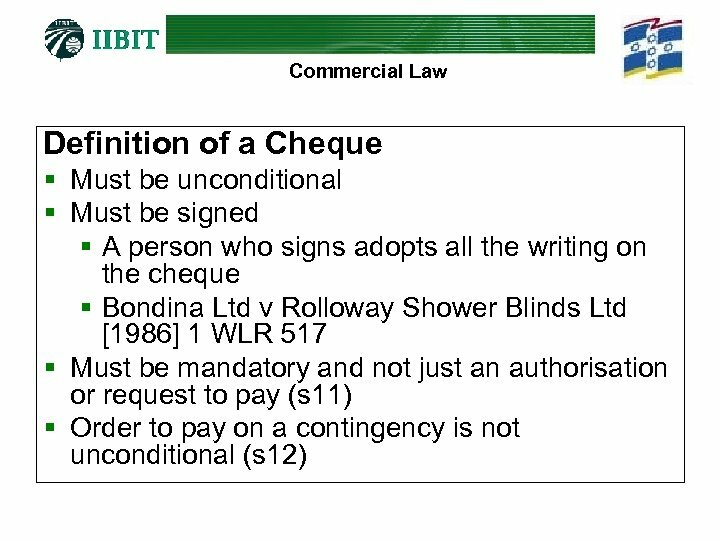 Each 180 days the bills would be “rolled over”, meaning new bills would take the place of those retired on maturity. 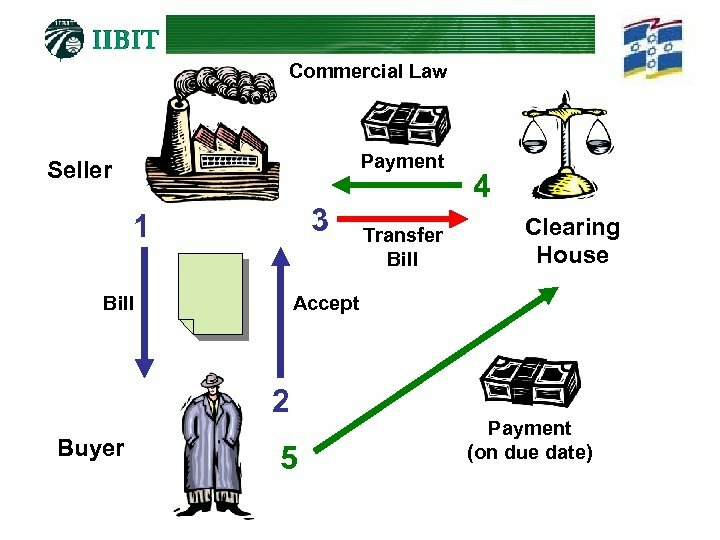 Commercial Law Commercial Bill Acceptance Facility § Method had advantage to Bank that it involved no actual advance of funds. 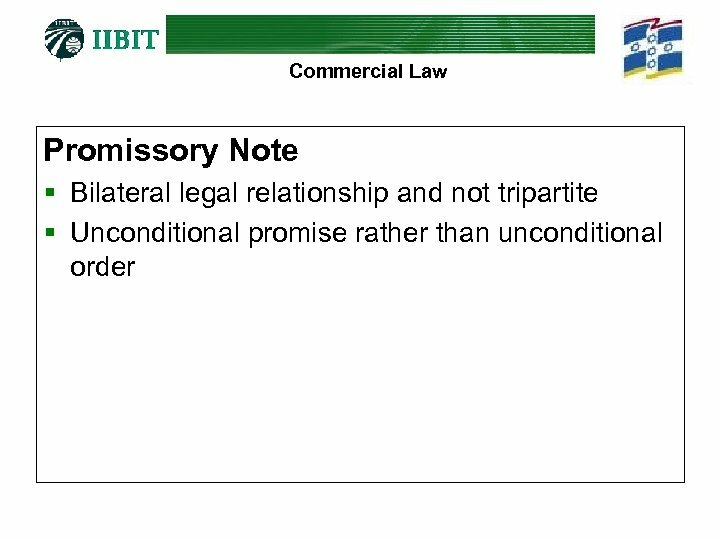 Instead the money came from the discounter, Tricontinental and ultimately other operators in the commercial bill market to whom Tricontinental might in turn discount the bills. 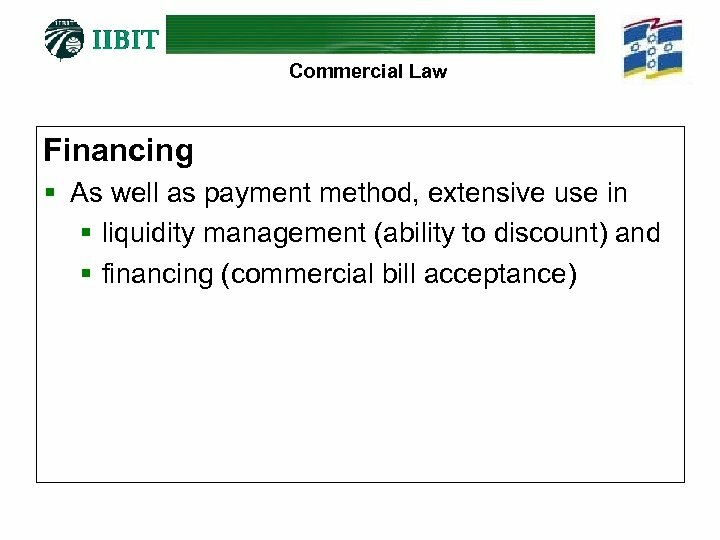 § The Bank supplied ready acceptability of the Company’s bills in the market place i. e. credit enhancement. 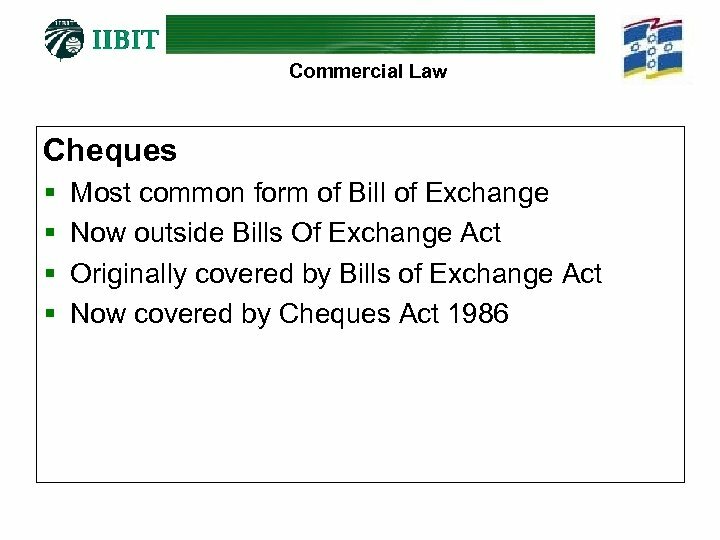 It added its name. 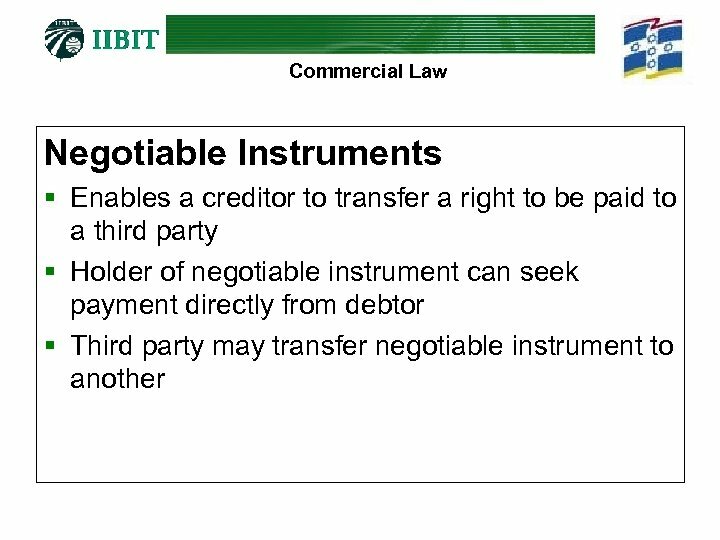 § In this case, security was required (land) but not always so if credit rating (often dependent on strong cash flow and debt service ability) sufficient. 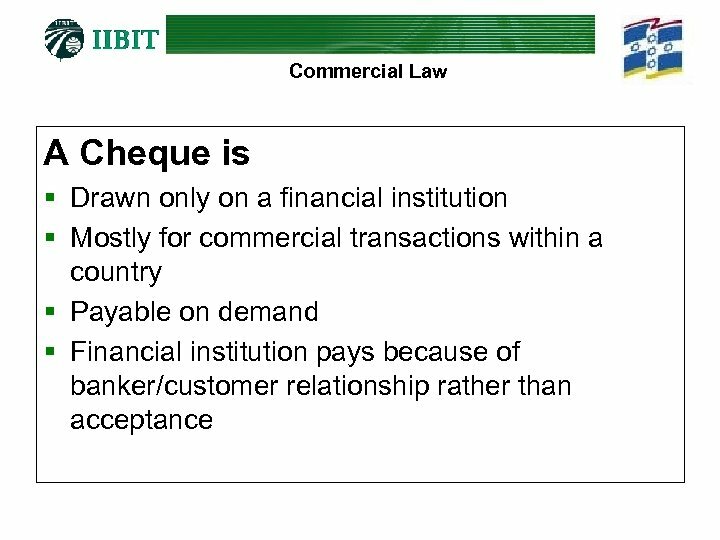 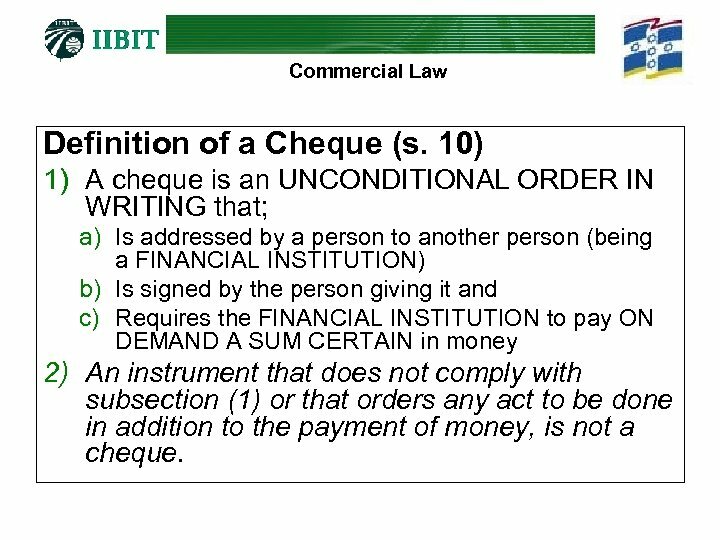 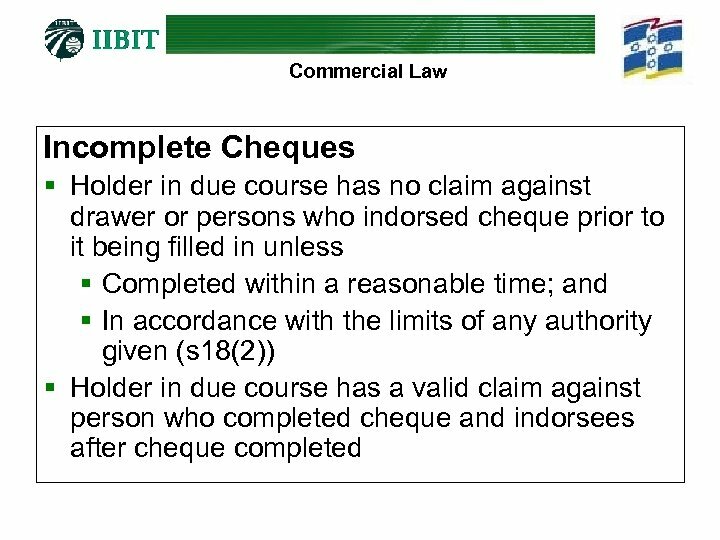 Commercial Law Definition of a Cheque (s. 10) 1) A cheque is an UNCONDITIONAL ORDER IN WRITING that; a) Is addressed by a person to another person (being a FINANCIAL INSTITUTION) b) Is signed by the person giving it and c) Requires the FINANCIAL INSTITUTION to pay ON DEMAND A SUM CERTAIN in money 2) An instrument that does not comply with subsection (1) or that orders any act to be done in addition to the payment of money, is not a cheque. 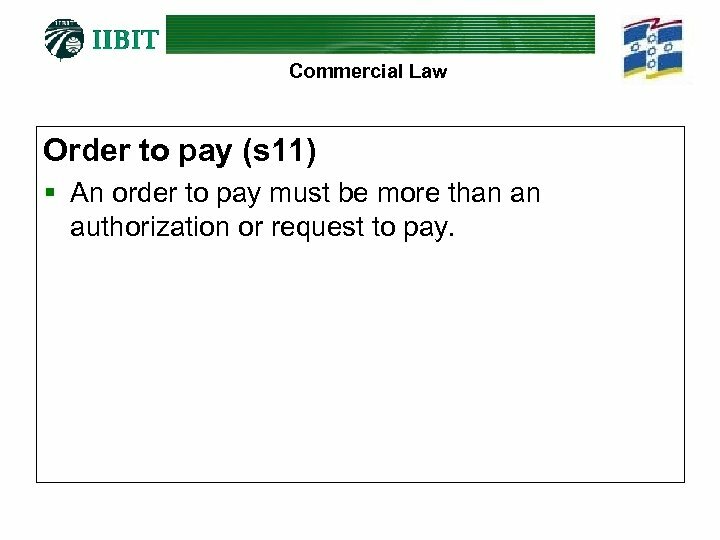 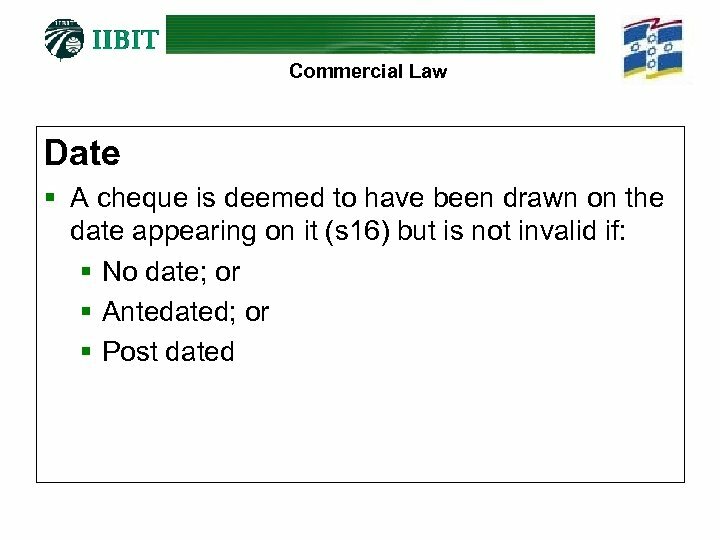 Commercial Law Order to pay (s 11) § An order to pay must be more than an authorization or request to pay. 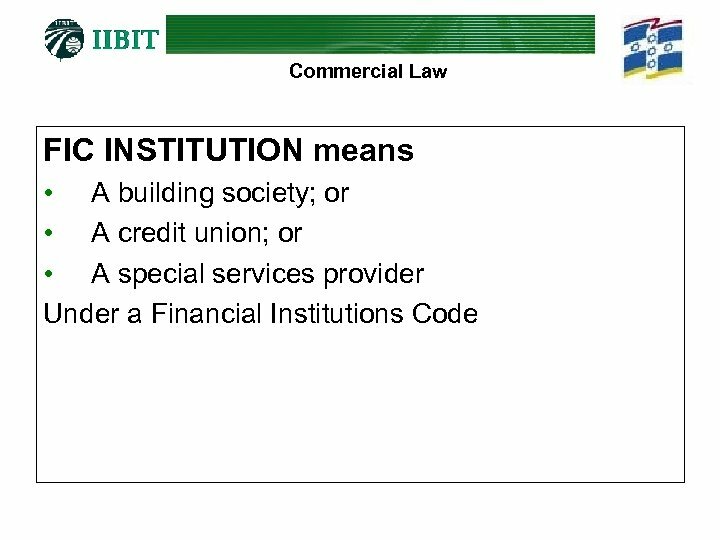 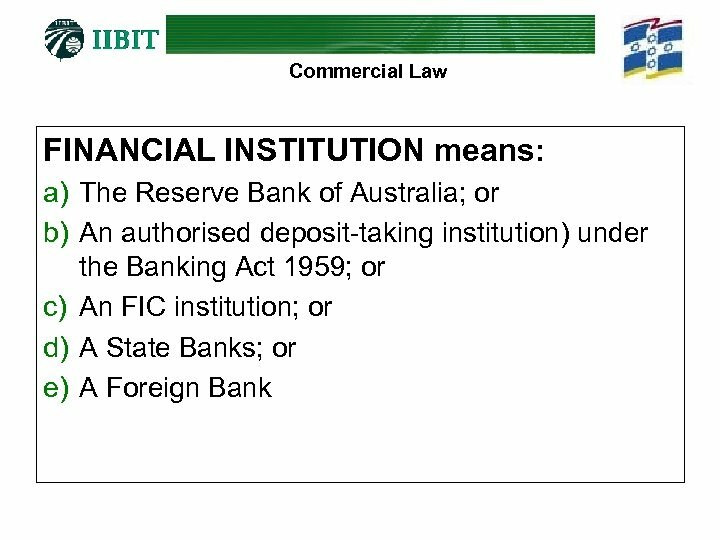 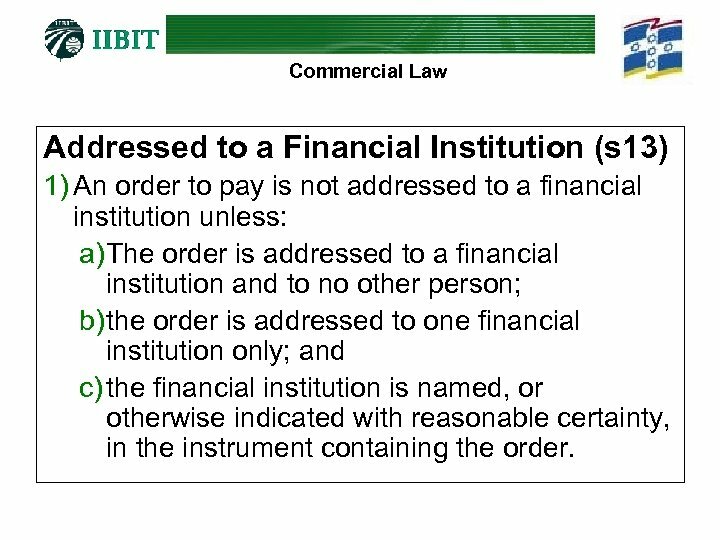 Commercial Law Addressed to a Financial Institution (s 13) 1) An order to pay is not addressed to a financial institution unless: a) The order is addressed to a financial institution and to no other person; b) the order is addressed to one financial institution only; and c) the financial institution is named, or otherwise indicated with reasonable certainty, in the instrument containing the order. 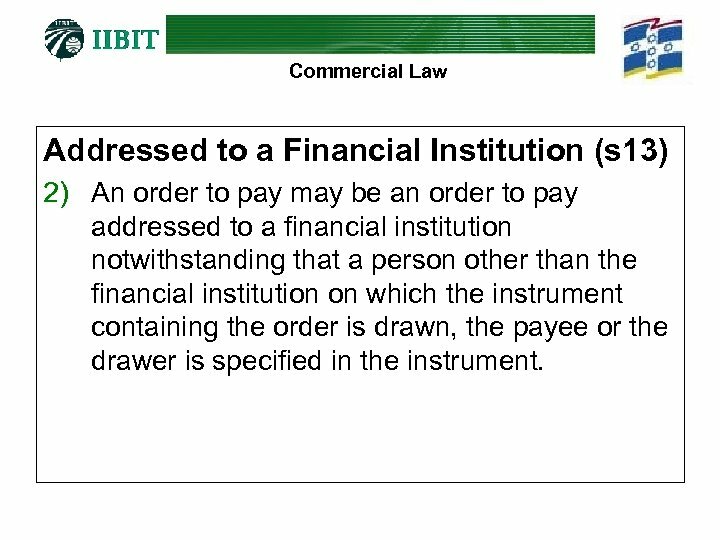 Commercial Law Addressed to a Financial Institution (s 13) 2) An order to pay may be an order to pay addressed to a financial institution notwithstanding that a person other than the financial institution on which the instrument containing the order is drawn, the payee or the drawer is specified in the instrument. 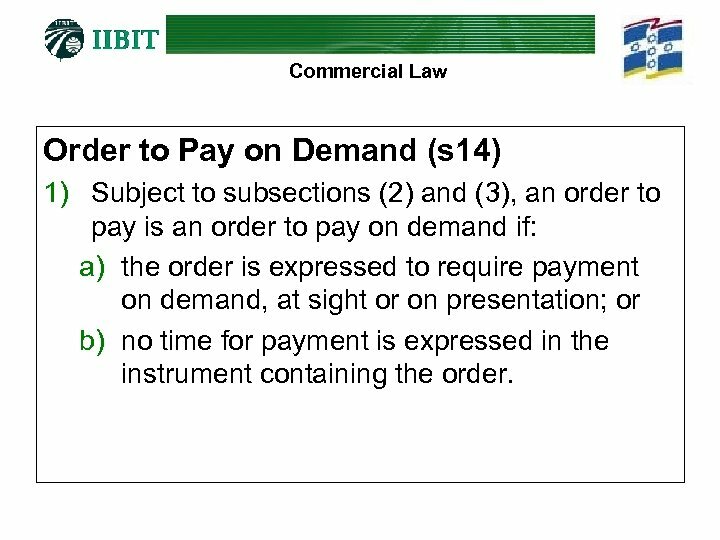 Commercial Law Order to Pay on Demand (s 14) 1) Subject to subsections (2) and (3), an order to pay is an order to pay on demand if: a) the order is expressed to require payment on demand, at sight or on presentation; or b) no time for payment is expressed in the instrument containing the order. 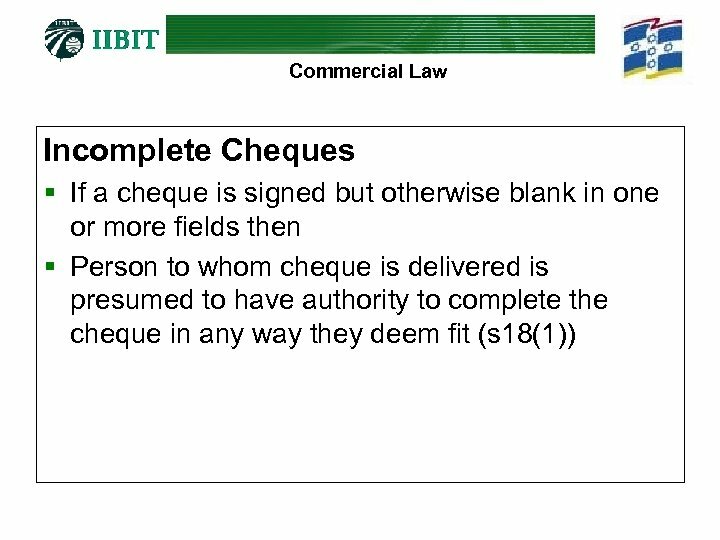 Commercial Law Order to Pay on Demand (s 14) (cont. ) 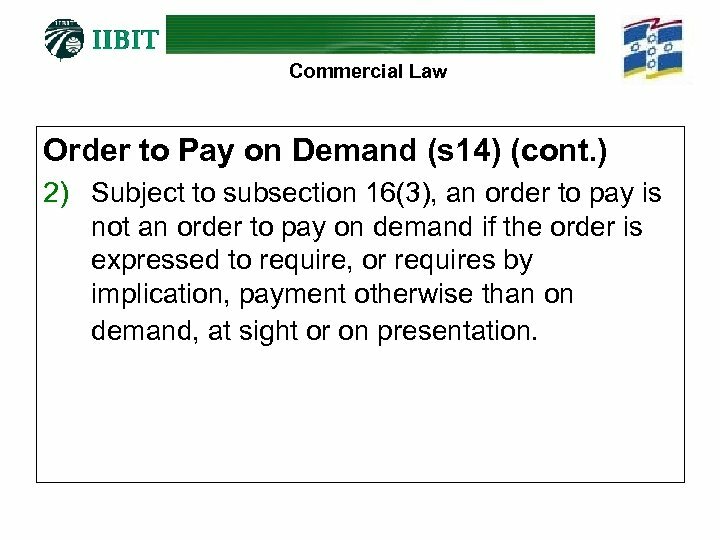 2) Subject to subsection 16(3), an order to pay is not an order to pay on demand if the order is expressed to require, or requires by implication, payment otherwise than on demand, at sight or on presentation. 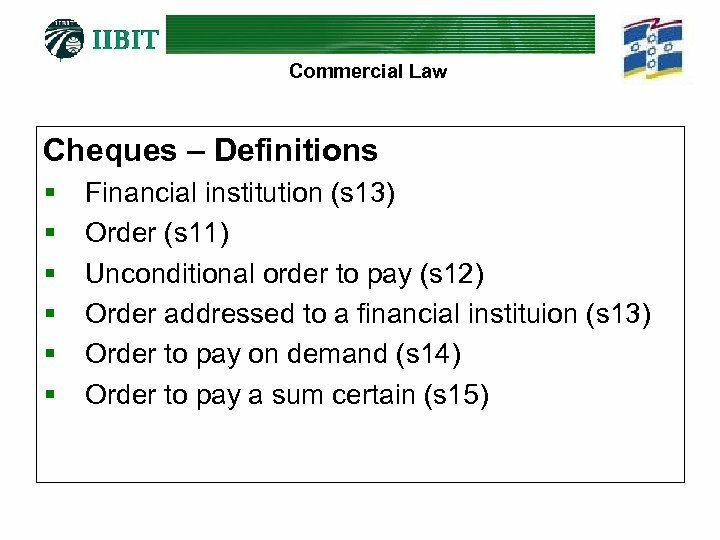 Commercial Law Order to Pay on Demand (s 14) (cont. ) 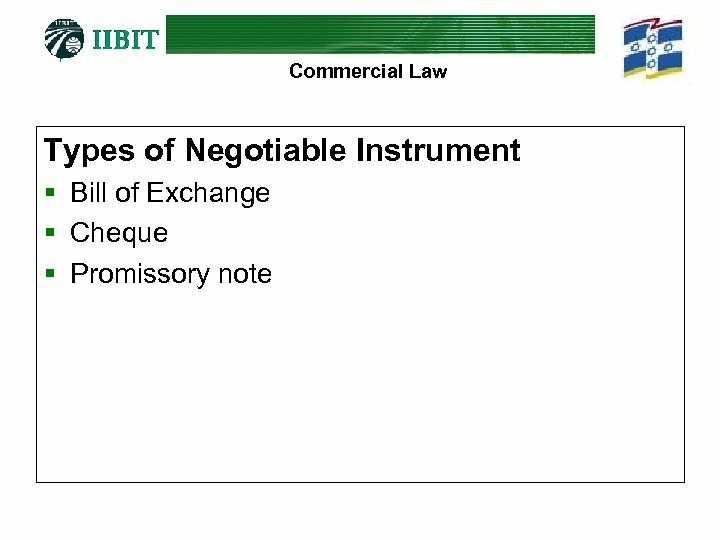 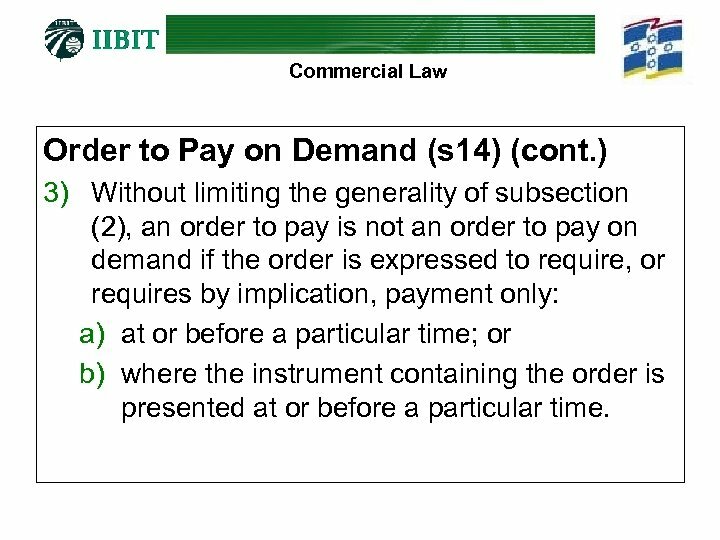 3) Without limiting the generality of subsection (2), an order to pay is not an order to pay on demand if the order is expressed to require, or requires by implication, payment only: a) at or before a particular time; or b) where the instrument containing the order is presented at or before a particular time. 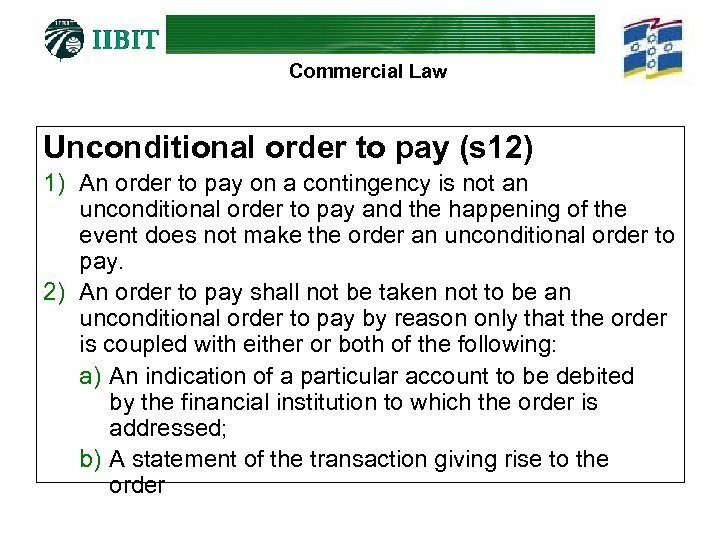 Commercial Law Order to Pay a Sum Certain (S 15) 1) Subject to subsection (2), an order to pay is not an order to pay a sum certain unless the sum ordered to be paid is specified with reasonable certainty in the instrument containing the order. 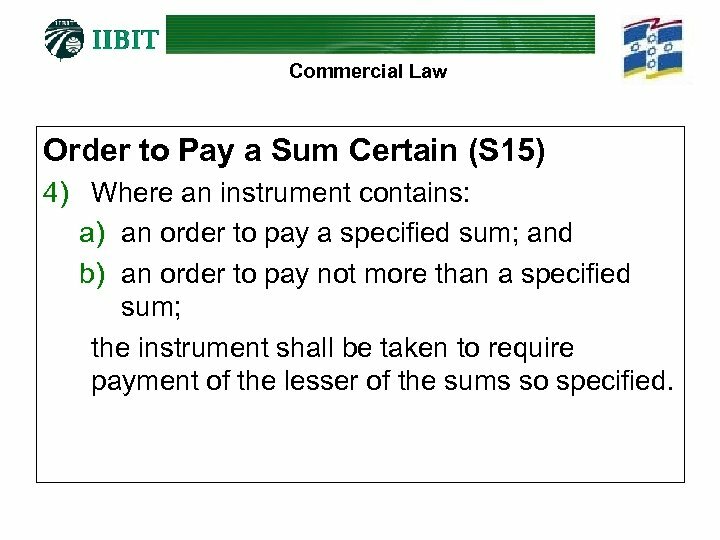 2) Where more than one sum is expressed to be payable in an instrument containing an order to pay, the lesser or least, as the case may be, of the sums so expressed to be payable shall be taken to be the only sum ordered to be paid by the instrument. 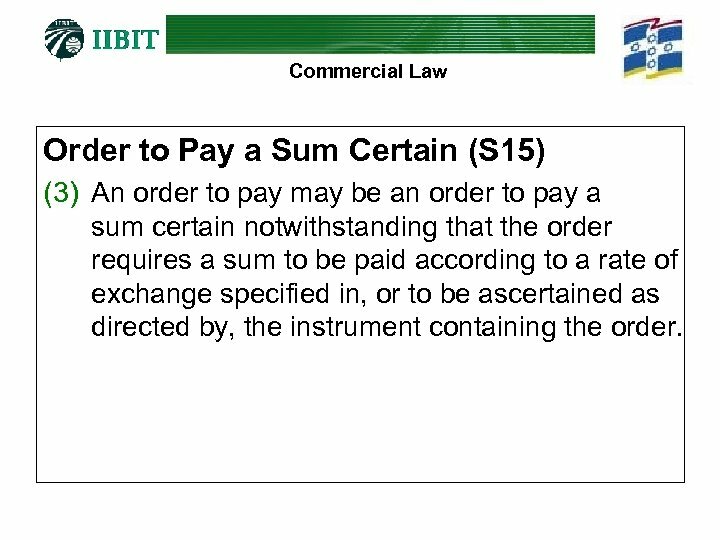 Commercial Law Order to Pay a Sum Certain (S 15) (3) An order to pay may be an order to pay a sum certain notwithstanding that the order requires a sum to be paid according to a rate of exchange specified in, or to be ascertained as directed by, the instrument containing the order. 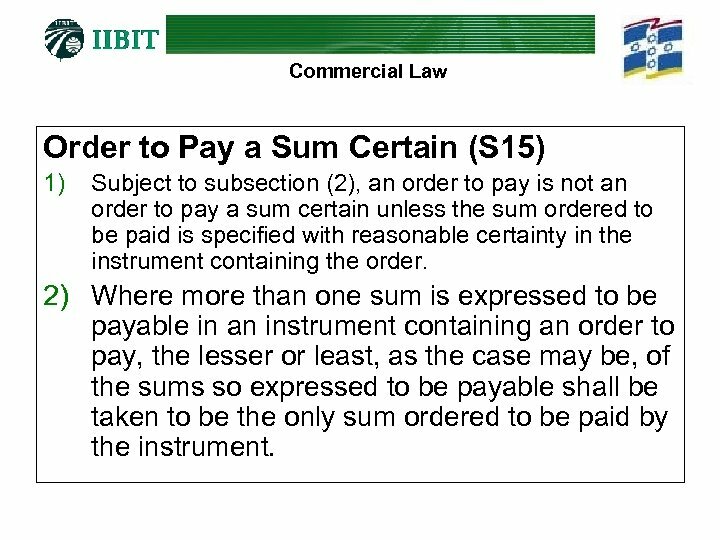 Commercial Law Order to Pay a Sum Certain (S 15) 4) Where an instrument contains: a) an order to pay a specified sum; and b) an order to pay not more than a specified sum; the instrument shall be taken to require payment of the lesser of the sums so specified. 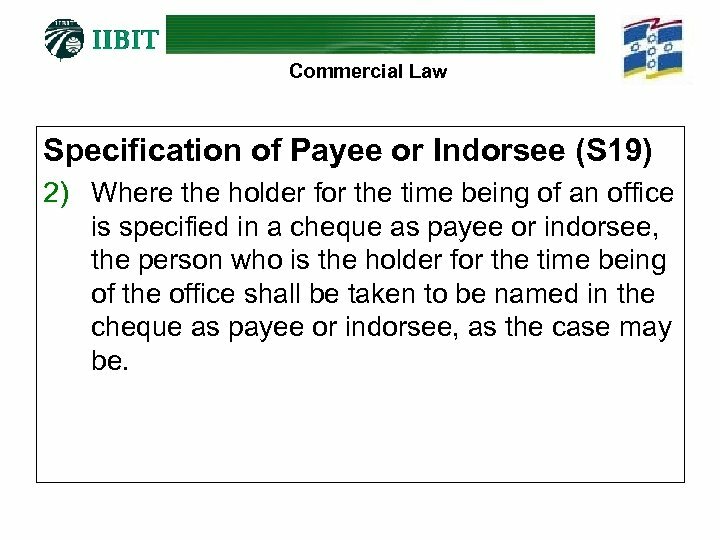 Commercial Law Specification of Payee or Indorsee (S 19) 2) Where the holder for the time being of an office is specified in a cheque as payee or indorsee, the person who is the holder for the time being of the office shall be taken to be named in the cheque as payee or indorsee, as the case may be.